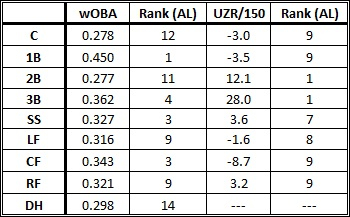 Below are some tables looking at where the Orioles stand in relation to the rest of the American League through the month of June. Since they are only 2.5 games out of first place and currently hold one of the 2 wild card spots, the Orioles should be buyers on the trade market this summer. Not much analysis here, and probably not a lot that you don’t already know if you follow the team, but this is meant to be a starting point to address team needs leading up to the trade deadline on July 31. Check the Fangraphs library for statistical definitions. Looking at the tables, it becomes pretty obvious that Baltimore needs pitching, and specifically starting pitching. They could also use some offense at 2B and DH, but I would imagine those needs would be secondary to getting some pitching help, since as a team, they have one of the best offenses in the AL. *As I finished up this post, news broke that the Orioles traded for Chicago Cubs SP Scott Feldman (and C Steve Clevenger) for Jake Arrieta, Pedro Strop, and international bonus cash). While not an ace, Feldman will definitely help the Orioles starting rotation. Needless to say, they still have some work to do on the trade market. Today’s post is actually located at Camden Depot, the Baltimore Orioles blog for ESPN’s Sweetspot Network, as they were kind enough to allow me to be a guest writer for their site. The post takes a look at Jake Arrieta’s recent demotion to AAA, and why he may not be entirely his fault. Please go over there and check out my post, as well as the other posts at Camden Depot, as they have some terrific stuff about the Orioles.